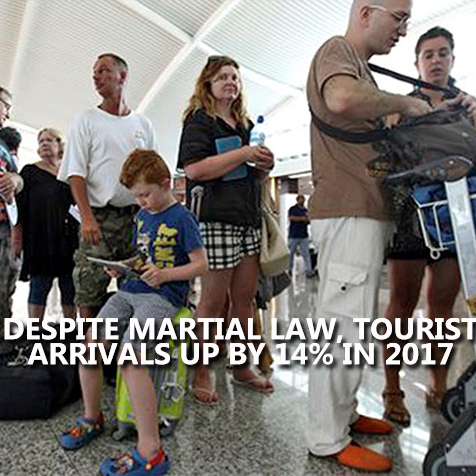 MANILA, July 6 -- Despite terror threats and the martial law declaration in Mindanao, foreign tourist arrivals to the Philippines from January to May this year rose by 14.43 percent to 2.882-million visitors versus the 2.519-million visitors in the same period last year. In an interview with the Philippine News Agency, Department of Tourism (DOT) Assistant Secretary and spokesperson Frederick Alegre said this was driven by the agency’s aggressive marketing efforts and the holding of international events in the country including the ASEAN Summit. Alegre said the top three markets are still Korea with 128,691 arrivals, USA with 83,056 arrivals, and China with 83,649 arrivals. For the month of May alone, the Philippines acquired 532,757 arrivals which is an increase of 19.60 percent compared to May 2016 arrivals at 445,449, he said. The DOT spokesperson said that for the first time this year, visitor arrivals surpassed the 500,000 mark. This was crucial, he said, because from 2012 to 2015, the month of May only generated more than 300,000 visitors. It produced more than 400,000 last year. Alegre pointed out that Pres. Rodrigo Duterte’s declaration of martial law did not put a dent to tourism numbers for the month of May. However, the effect of cancelled bookings might start to show in the following months. “The effect is really in future bookings which we monitored now. Initial cancellations became re-bookings,” he said. He said the DOT is open to boosting tourism efforts in conflict-torn Marawi City and in the entire Mindanao as soon as the situation normalizes. “Again, the DOT feels that the declaration of martial law is a temporary situation because we know that overall result is to make Mindanao a safe place to live and to visit,” Alegre said. He reiterated that terror threats do not stop tourists from traveling.